Indexes rose sharply for the third day in a row, but these two retailers slipped. Stocks rose today for a third-straight session, making it more likely that indexes will end 2015 on a positive note for U.S. markets. 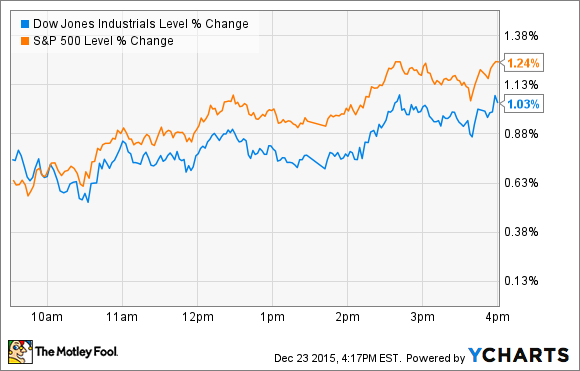 The Dow Jones Industrial Average (DJINDICES:^DJI) gained 188 points, or 1.03%. The S&P 500 (SNPINDEX:^GSPC) added 25 points, or 1.25%, to push further into positive territory for the year. In economic news, oil prices jumped 5% higher after the government announced that crude oil inventories fell by 6 million barrels last week compared to an expected 600,000-barrel uptick. That shift helped send energy stocks higher, as Chevron and ExxonMobil were the two best-performing stocks on the Dow. Consumer confidence also rose to its highest level since July, according to the latest survey from the University of Michigan. Meanwhile, Nike (NYSE:NKE) and Bed Bath & Beyond (NASDAQ:BBBY) sat out today's big rally. Both stocks fell after posting quarterly earnings results. Nike, the best-performing stock in the Dow this year, fell 2% despite posting strong fiscal second-quarter earnings results. The footwear and apparel giant managed 4% higher revenue -- and a 22% spike in profits -- to $0.90 per share. That earnings figure beat Wall Street expectations, while sales growth was just shy of consensus targets. Nike's fiscal second quarter included much of the same good news that has powered the stock's 34% rally this year. Sales rose by double digits in each of its geographic markets, profitability expanded to a gross margin of 46%, and muted expenses helped net income spike higher by 20%, to $785 million. Nike also logged a 20% bounce in futures orders, indicating significant demand for its apparel and footwear products over the coming quarters. "Our strong Q2 growth and profitability show that Nike continues to drive real momentum," CEO Mark Parker said in a press release. However, in a subsequent conference call with analysts, management revealed that, while its global inventory position is healthy, the U.S. market has a buildup of excess product. Nike plans to get back into balance during the next few quarters, but clearing out extra inventory will hurt the bottom line. The company sees gross margin slipping by 0.5 percentage points next quarter. It's that expected pullback in profitability that likely spooked Wall Street today. Specialty retailer Bed Bath & Beyond was the worst percentage-point loser in the S&P 500, dropping 5% after posting preliminary third-quarter earnings results. The early numbers weren't good. Rather than showing sales growth of 3%, as management had predicted, revenue rose by less than 1% for the three-month period that includes the Black Friday holiday shopping crush. Executives blamed lower foot traffic, which was partially offset by e-commerce growth. "On the one hand, we experienced softer in-store transaction counts," CEO Steven Temares said in a press release. "On the other hand, sales from our ... digital channels demonstrated strong growth, in excess of 25%," he said. But e-commerce gains aren't going to be enough to keep Bed Bath & Beyond's growth pace intact. Management lowered its fourth-quarter comparable-store sales guidance to 1% from 2%. Temares and his team also dialed back their expectations for profits: Earnings are seen coming in at $1.09 per share at the midpoint of guidance, compared to the prior target of $1.18 per share. "As the retail environment continues to evolve, we remain focused on positioning the company for long-term success," Temares said. The company will post its official Q3 numbers on Jan. 7.